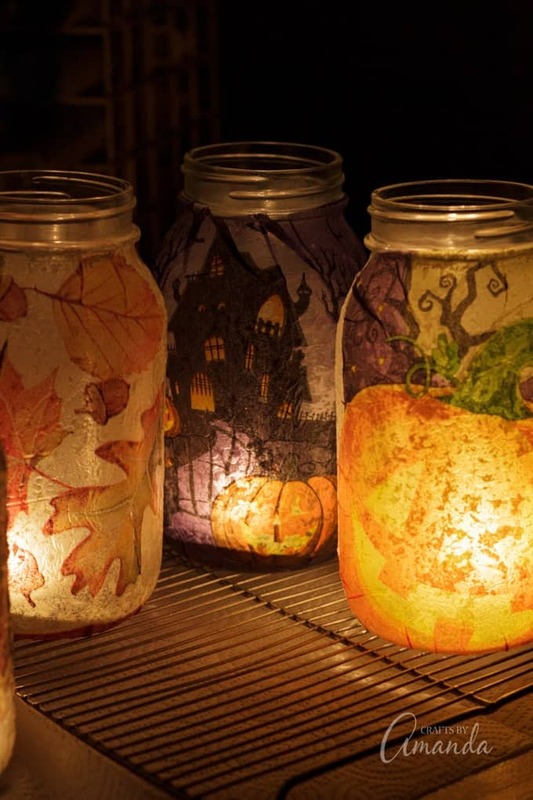 Fall Napkin Luminaries : Halloween and fall designs you can make! 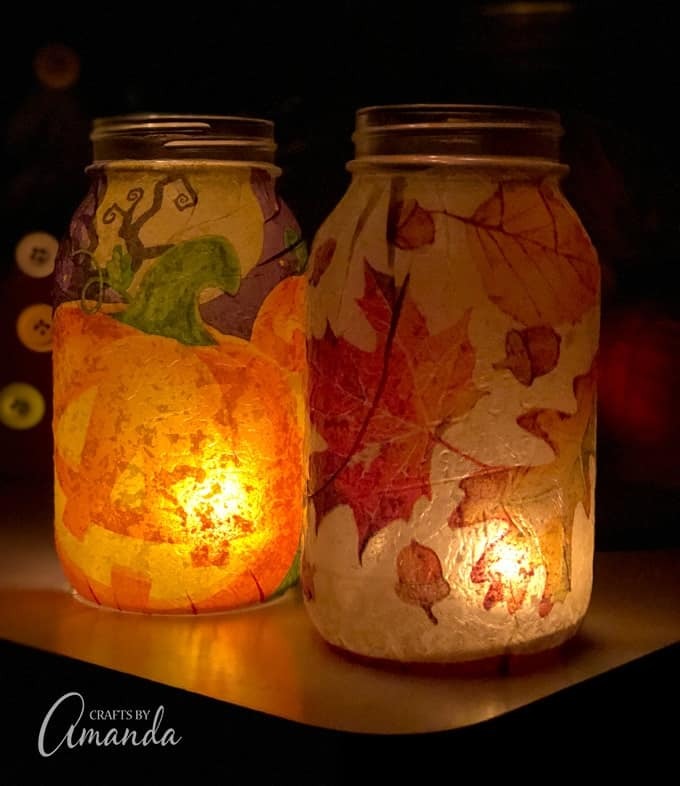 I’m all about luminaries and have made many different kinds over the years. 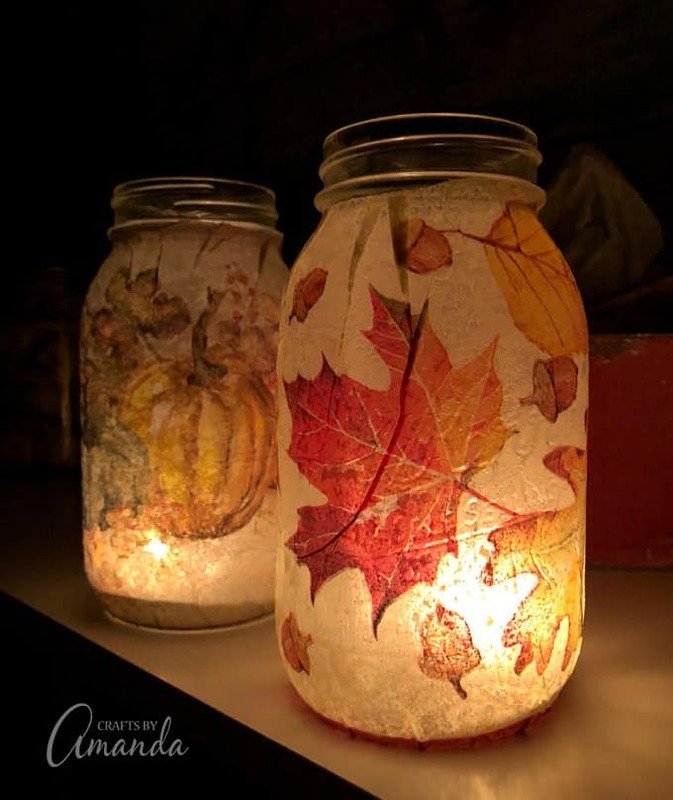 These fall napkin luminaries make use of pretty fall and Halloween paper napkins that you can find at dollar stores, big box stores, and even the grocery store. 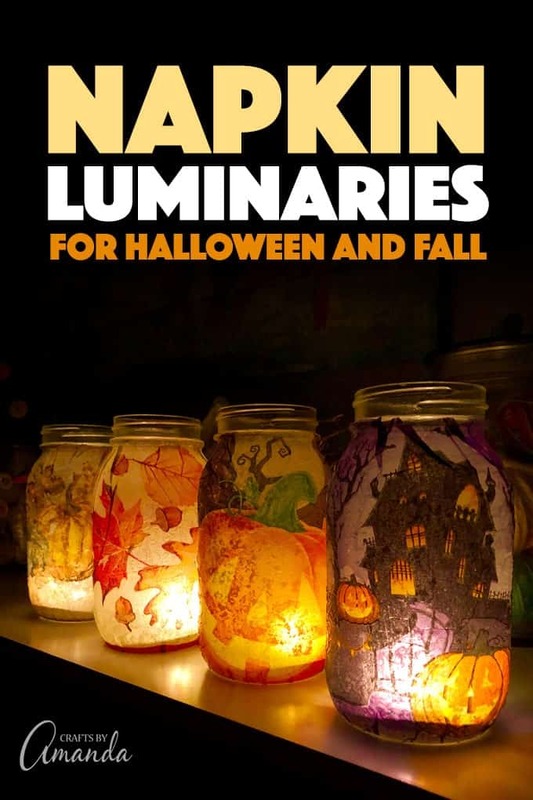 If you’re looking for an easy project for girl’s night, need something seniors can make, or just want to add something to your home decor this fall, these Halloween and fall napkin luminaries are a great choice! I recently did a Facebook live for this project, but if you prefer to skip the full-length version, you can view the edited version of the video tutorial in this blog post. Don’t use white glue and water – while this solution does work, it can yellow over time. Mod Podge (and other decoupage mediums) is formulated to prevent yellowing. 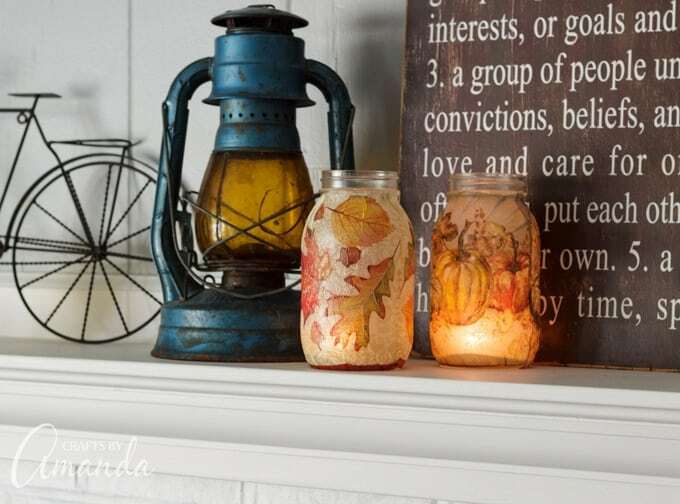 Do “prime” your jar first by applying a thin layer of Mod Podge. This will make the glass tacky and will make it easier to apply the napkin. Separate double ply napkins if you have them. The ones I used in this tutorial were sturdy one-ply napkins. Apply Mod Podge gently and with a light touch over the napkin to avoid ripping it. Remember, decoupage medium is a liquid and napkins are delicate. Using a heavy hand can cause damage to your pretty design! When applying the Mod Podge, use a generous amount but not so much that dripping occurs. 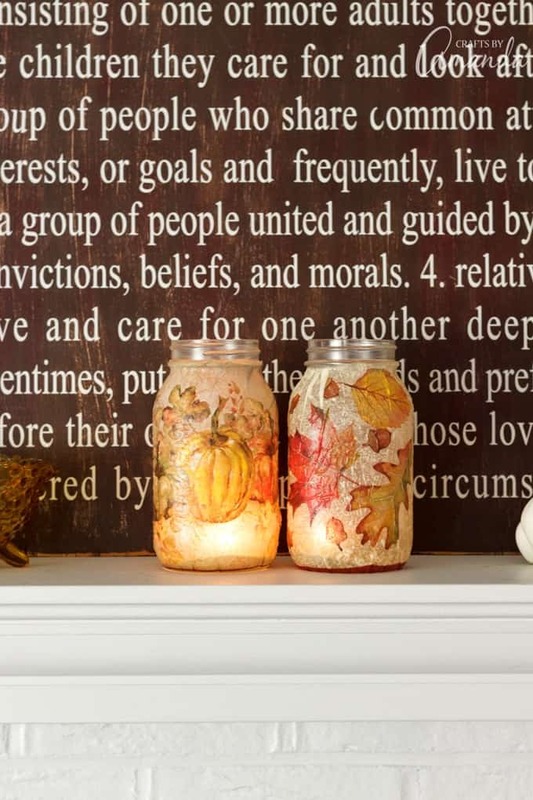 Be sure to allow your finished project to dry completely (overnight is best) before adding a candle and displaying. Always store your Mod Podge with a tight-fitting lid and in a cool place out of reach of children. Placing your wet decoupage projects onto a wire cooling rack keeps them from sticking to your table! Wash and dry your glass jar. Prepare your paper napkins by separating ply (if needed) and cutting out designs. Apply a thin coat of Mod Podge to the front of your jar. Lay jar on its side with the wet side facing up. Place napkin onto the jar, pressing gently from the center outward. Apply Mod Podge to the bottom, side edges and rim. Using a gentle hand, apply a coat of Mod Podge over the top of the entire napkin. Repeat steps on the back side of the jar. 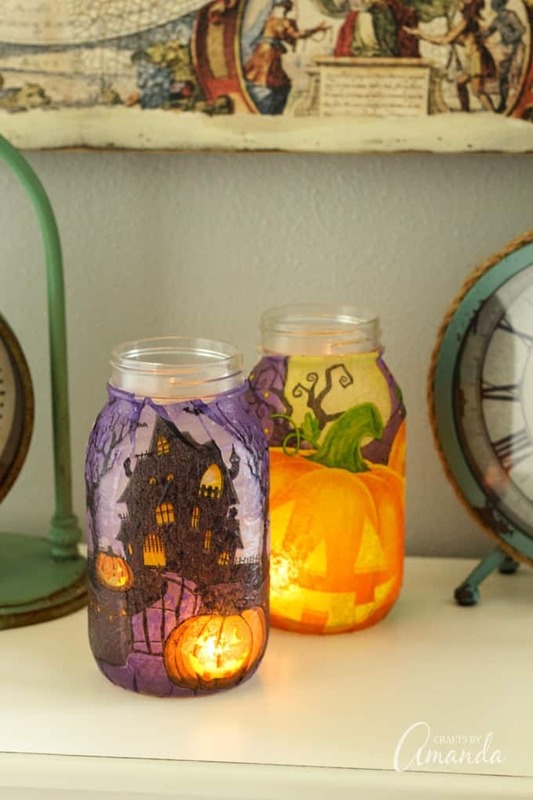 Allow everything to dry completely (overnight is best) before displaying and adding a candle. You can decorate the rim with burlap, ribbon or twine, but this step is completely optional. Be sure to watch the video in this post for help with this project! 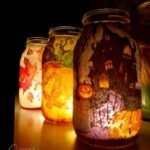 We have plenty of fall and Halloween craft projects on this blog, but here are some we hand picked for you! 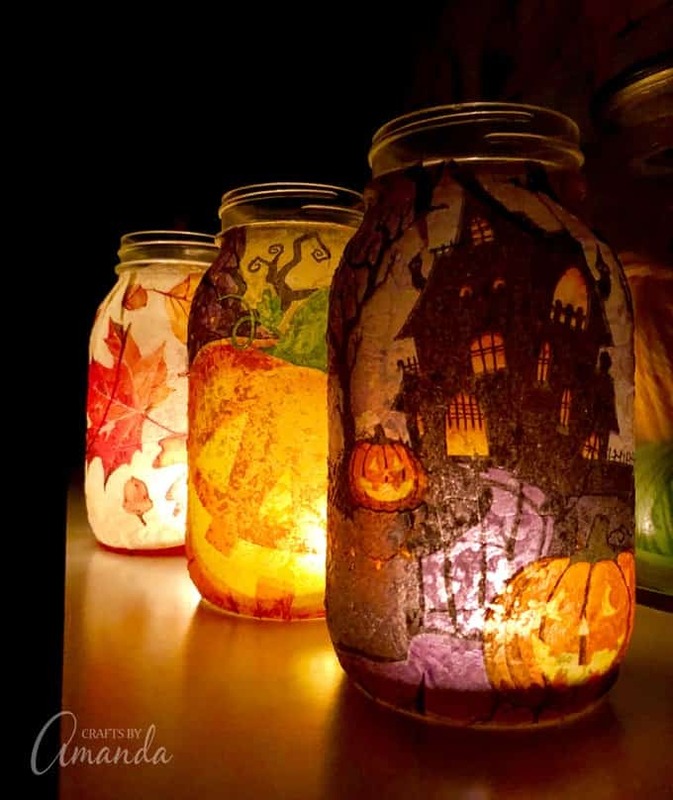 And be sure to check out this large collection of homemade Halloween decorating ideas! 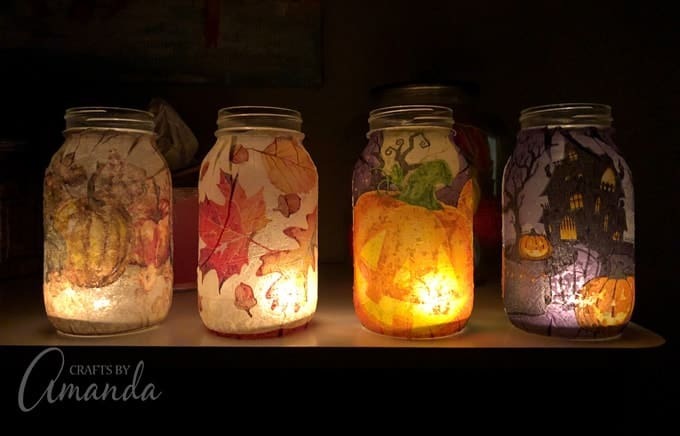 These fall napkin luminaries are easy to make and look so beautiful in your window, on your mantle, or atop your Thanksgiving table! Have you ever had to lightly wash any Mod Podge luminary if the outside has gotten dirty? Please advise; thanks! Yes! I just use a damp cloth making sure the cloth is not saturated, but completely wrung out. What do you use for the light? Hi Cindy! I used regular tea light candles (flame) but you can use battery operated tea lights or string lights! Hi Amanda. Could this be done to drinking glasses? Im thinking some glasses.. Yes, but if you plan to use them for actually drinking out of I would leave about an inch at the top of the glass without any napkin or decoupage. Also, Mod Podge makes a dishwasher formula! Hi Amanda, this idea is absolutely amazing. I’m actually planning to make one (but not of a Halloween design) It’s for my surprise anniversary date with my husband. I found something similar on escorts awesome London date ideas but it didn’t really explain how to make it. Thank you for being the missing link! You’re awesome. How fun, so glad it was helpful!! Yes I believe that would work! A gloss clear paint or clear sealer would work too! Glad you like the site, thank you!! Love the jar idea but I was wondering can you use a votive candle inside ?? Hi, I was wondering if these could be used outdoor? Thank you they are beautiful!